Hakan Lidbo who will supposedly recieve a first class star-banner on his gravestone. 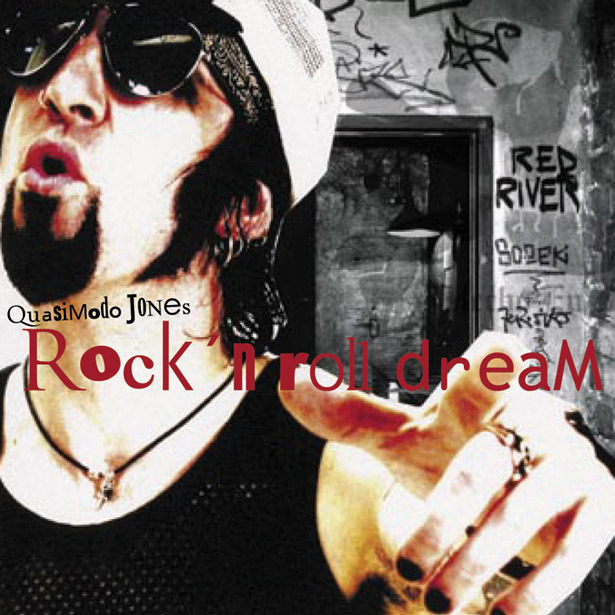 "Rock'n Roll Dream" hit first place with readers of "Hustler" magazine in the category of hog-rotten rock songs. This is why T.Raumschmiere drops off a remix with only one hand. Even the astounding Beate Bartel heard about it from the center of the earth where she has been residing of late. From here she sends her recordings against the laws of gravity straight up a shaft directed at select groups. "Somebody stop me before I kill again," the other piece of Quasimodo Jones, is of another caliber maybe 22mm spooky electro. The nice thing about this record is, moreover, that it's not an album. That one's still on the way says the official smog warning coming from the Shitkatapult camp. But who really is Quasimodo Jones? Jones is an orphan from Wisconsin and also a tramp who cites the riddim of train-wheels as an early musical influence. He learned to drink, throw down, and accept Elvis as King from his stepfather. His mother taught him to scream since that's how he came out into the world thanks to her alcohol and heroin abuse. Even though he never handled it well, Jones was allowed to stay at home since school was regarded as something for rich snobs by his caretakers. His first experience on stage was at the tender age of 8 with the Oak Ridge Boys. His second performance was with a stolen guitar from the neighboring kid where he sang Elvis songs and ended up in juvi. This is where he first discovered smoking up along with other drugs. He is most proud of having hit his stepfather in the face with a baseball bat, knocking all of his teeth out as he fell from a tree onto the ground. His favorite show is Alf.